This past Sunday was the weekend before our new league started up, and we got some practice games in. First up I played James M. who wanted to try out the new Daemons and see what might work and what wouldn't. For the second, I played Josh B. 's Grey Knights. Both games were 750pts. We played Crusade, with Dawn of War deployment. I figured that I would want to advance, see where his deep strikers landed and pounce where I could, so I put my objectives midfield. 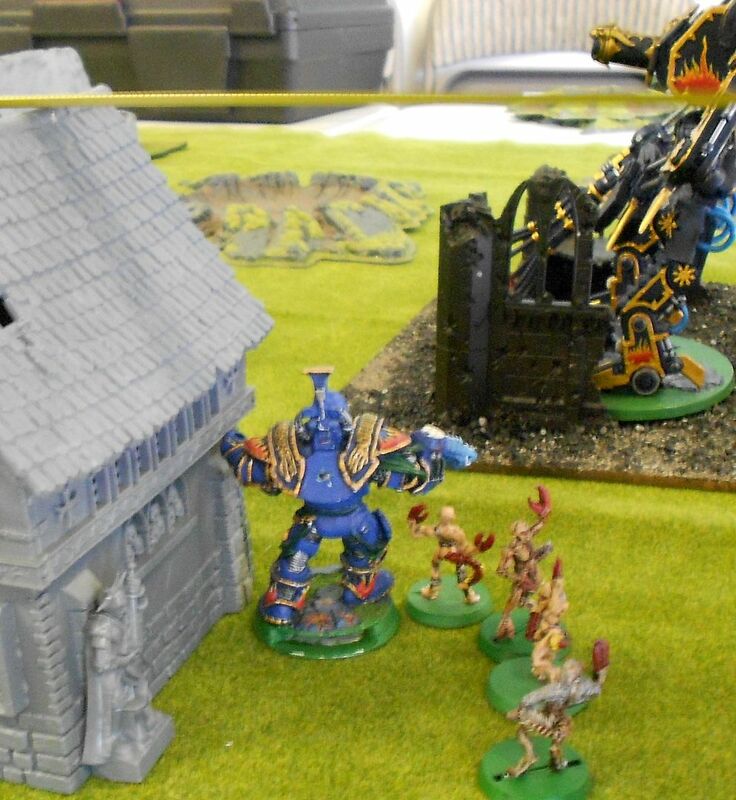 He set up with the soul grinder (represented here by a defiler) in some ruins, prince and daemonettes behind the quaint gray cottage, with horrors in reserve. 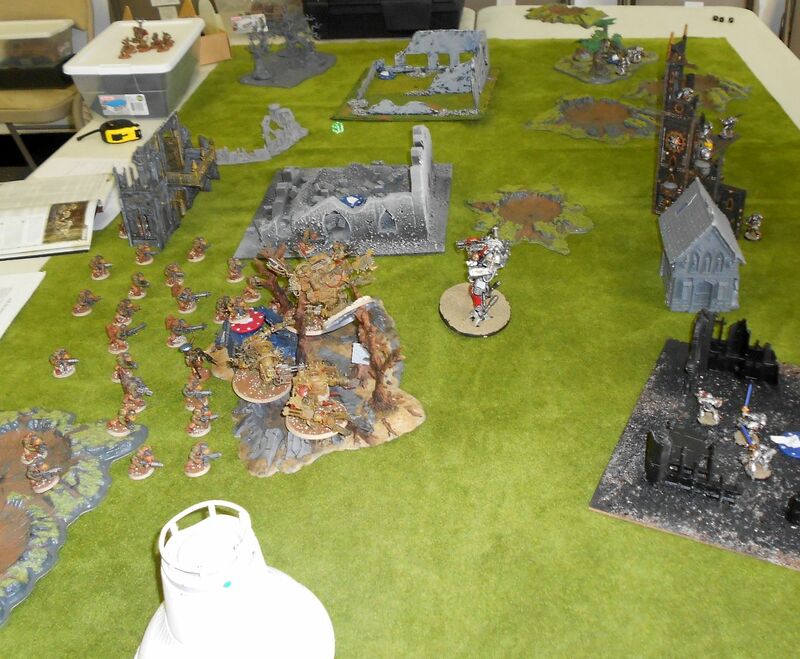 I put the dread and kans up front but still in KFF range, with wave of boys following, lobbas hidden and koptas ready to move up and snipe at soul grinder, though I doubted I would get much in the way of results. He got some useless daemon warlord trait, I got my Orks to get Furious Charge in the enemy DZ...which they have anyways. Whee. 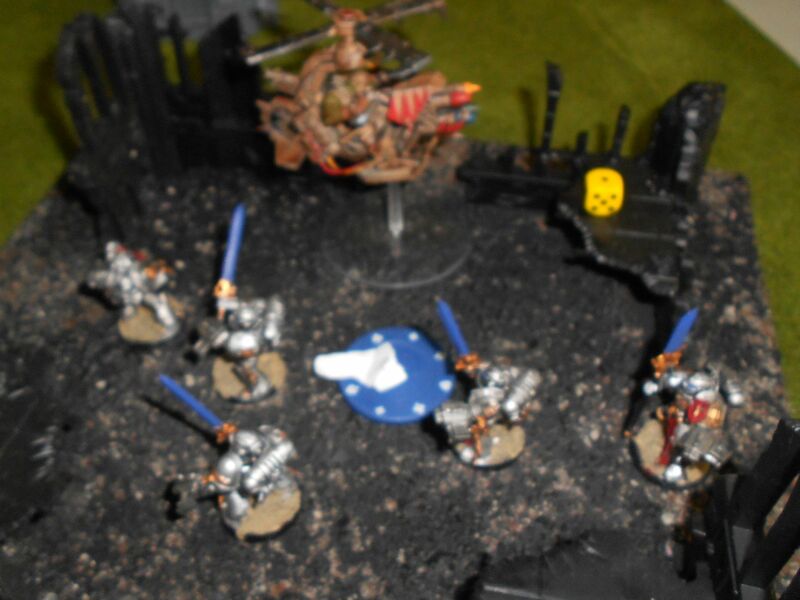 The daemons decided to stay put while waiting for reinforcements. 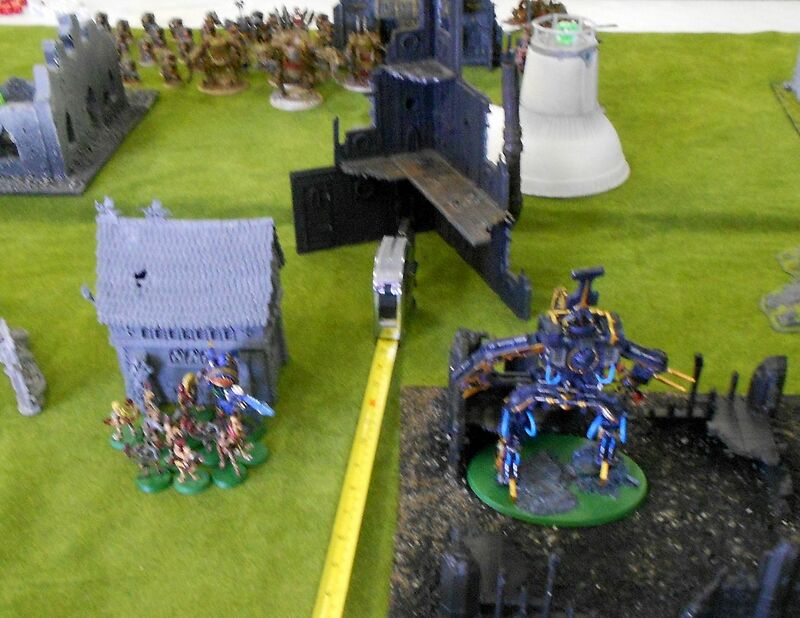 In the ork turn, lobbas rain down on the cottage and the daemonettes behind, blasting many back to the warp. 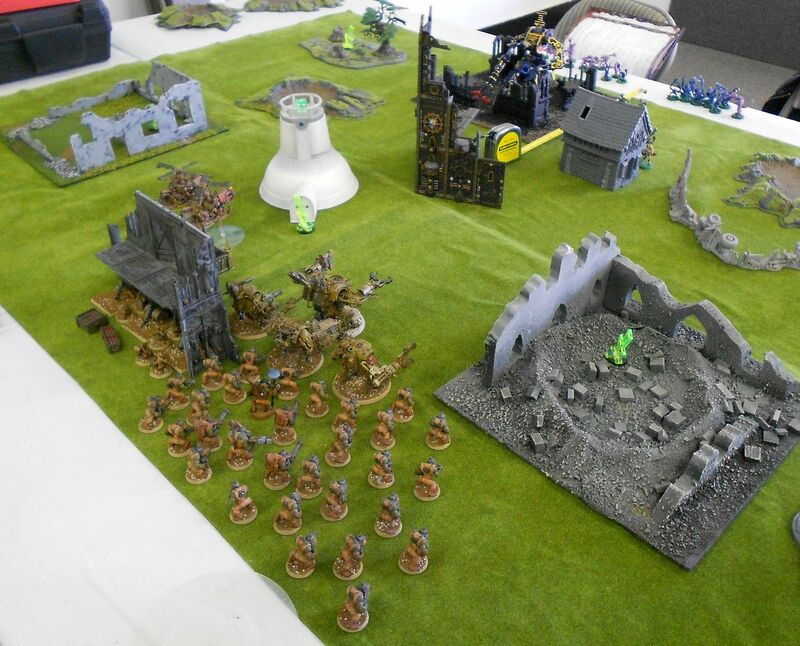 Orks advancing while daemonettes break off towards an objective. Da Redtoof Devil coming for the daemons! 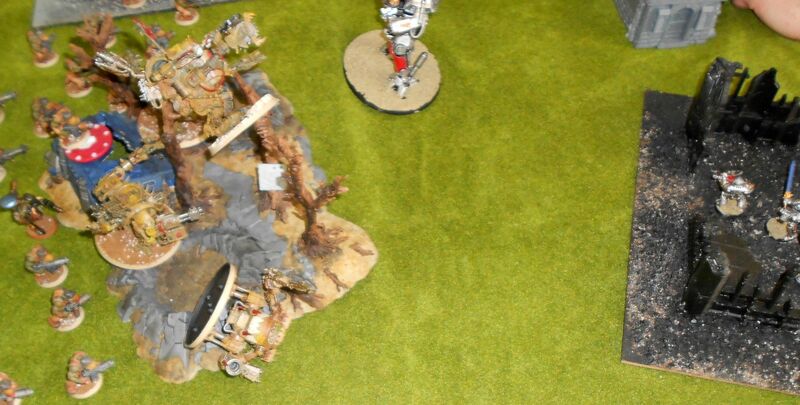 Prince lashes a kan down, and soul grinder blasts the dread. The daemon warpstorm or whatever it's called chart was not being kind to James that day. His daemonettes had to take an instability test and disappeared. Later on he'll have more fun with it. Soul grinder turned dread into a crater, and prince assaults and finishes off the kans, but leaves himself close to a bunch of angry orks! Waaaaagggghhhh! 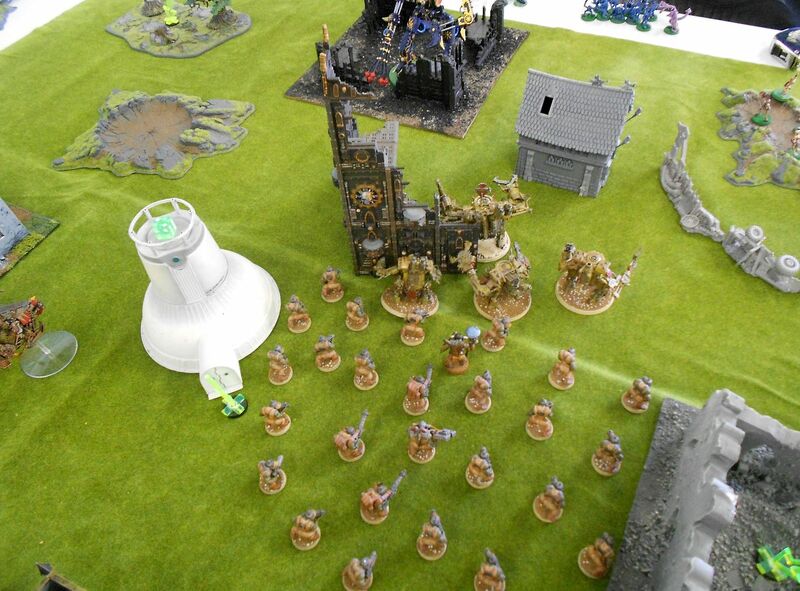 Orks swarm over the fallen kans, losing a few boys to close combat arms that hadn't stopped twitching yet. A flood of blows finishes the prince. Horrors arrive and start blasting. 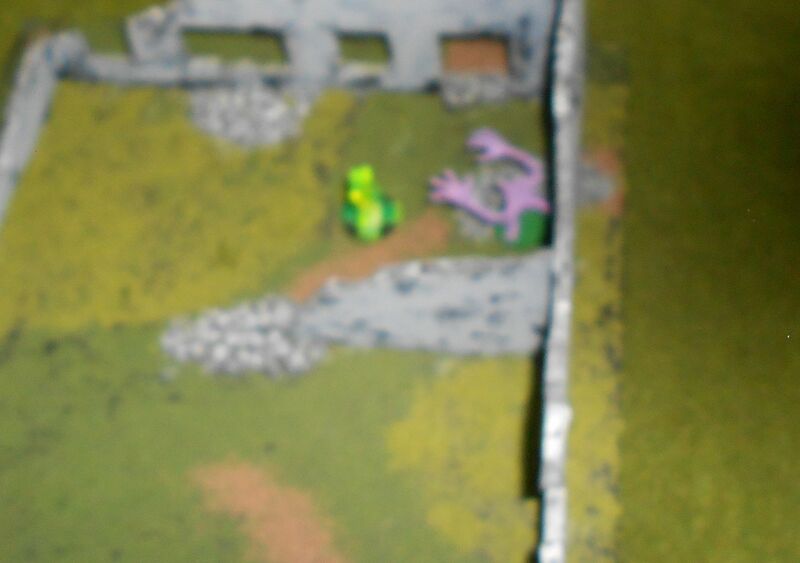 The clear the grots and move to the objective. 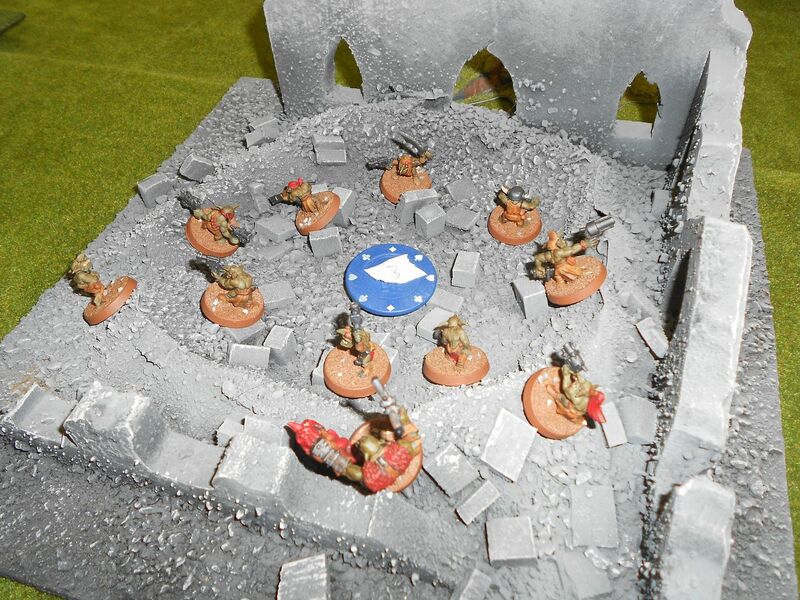 Another squad is on the other side of the table, tangling with Orks and koptas. Both squads get shot up by lobbas and shoota boys. 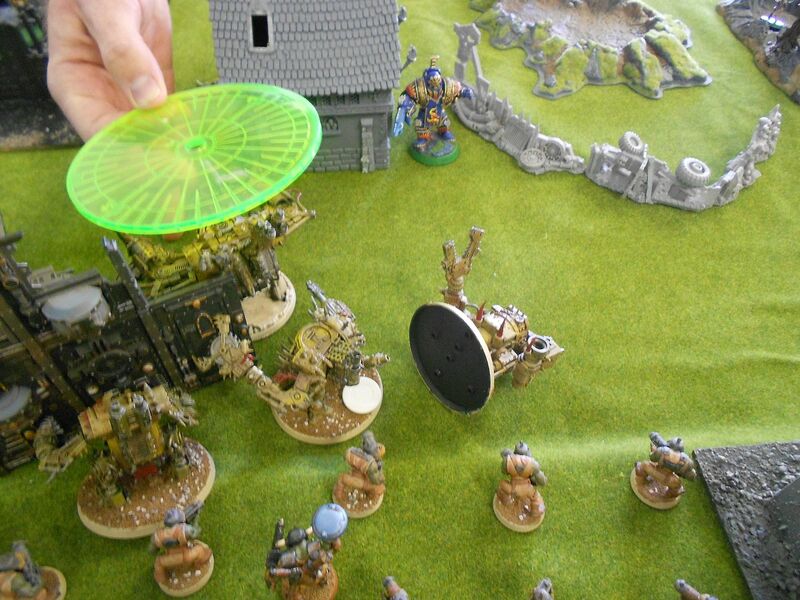 And another roll on the chaos table makes the horrors disappear. This one remaining horror blipped out at the same time, also from the chaos chart. So, a win for the orks, but it felt pretty lousy. If I had just deployed and stood in place we would have gotten to a similar result. 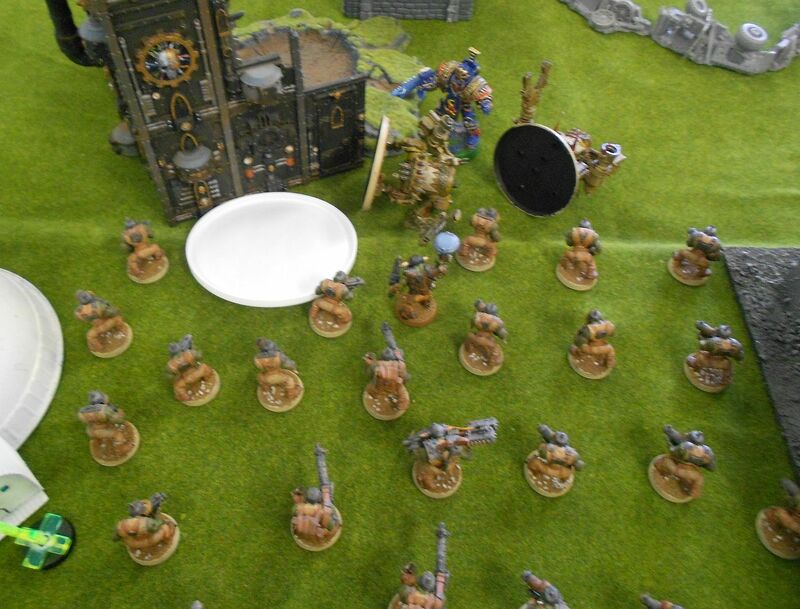 This was against Josh Bean's Grey Knights. We played the Scouring (fast attack scoring). 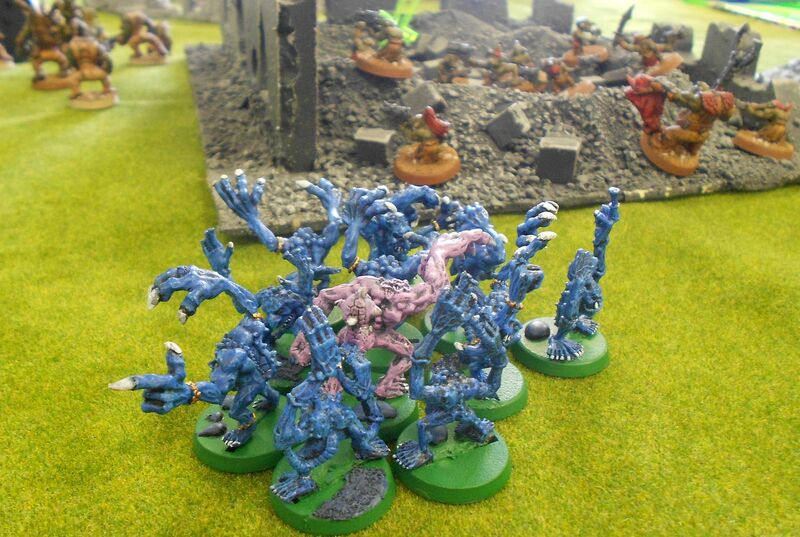 My koptas and grots were in reserve, with the koptas outflanking. 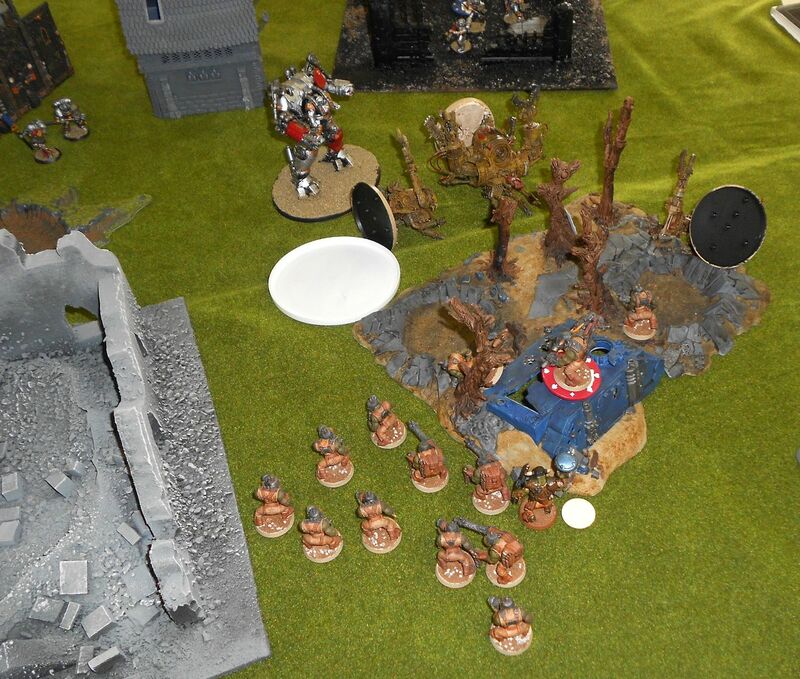 Above, the Ork horde surges forward as the dreadknight teleports in to face them. One can falls to psycannons, but there's plenty of stompiness left! Here's where I get greedy. 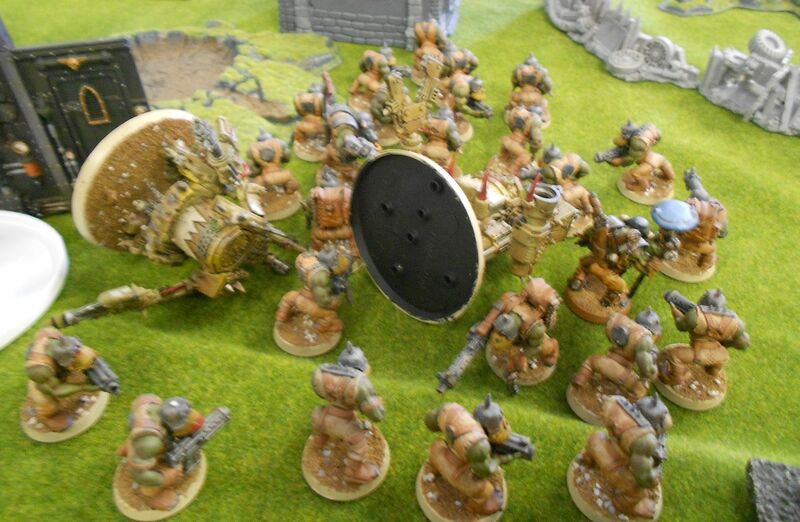 I send the Kans into the dreadknight, and try to charge the deff dread into a grey knight squad. I should have just concentrated on killing the big threat, the dreadknight. 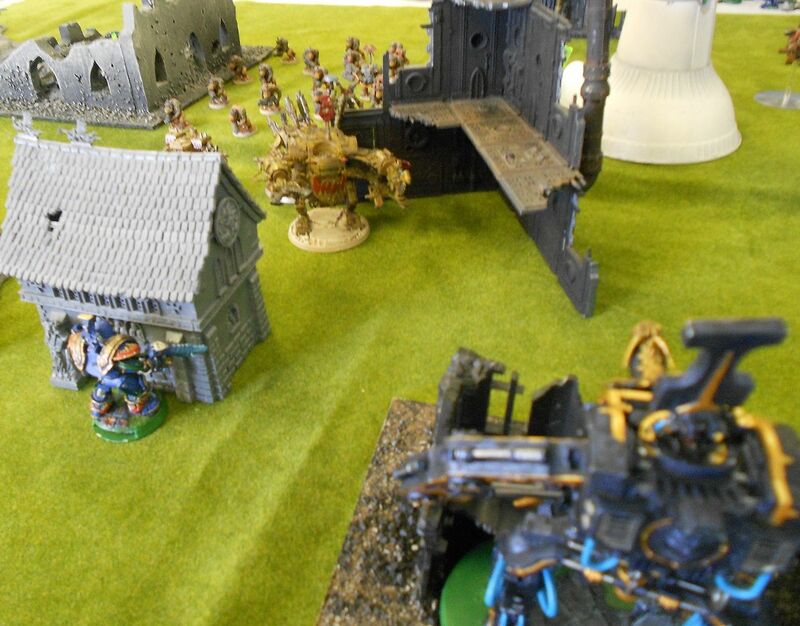 As it turned out, the dreadknight smashed both kans and the deff dread failed his charge, leaving him open for having his hull points psycannoned away. The orks had been whittled down to almost nothing from stormbolters, psycannons, and torrent flamer from the dreadknight. I try to charge the survivors into the dreadknight and fail. 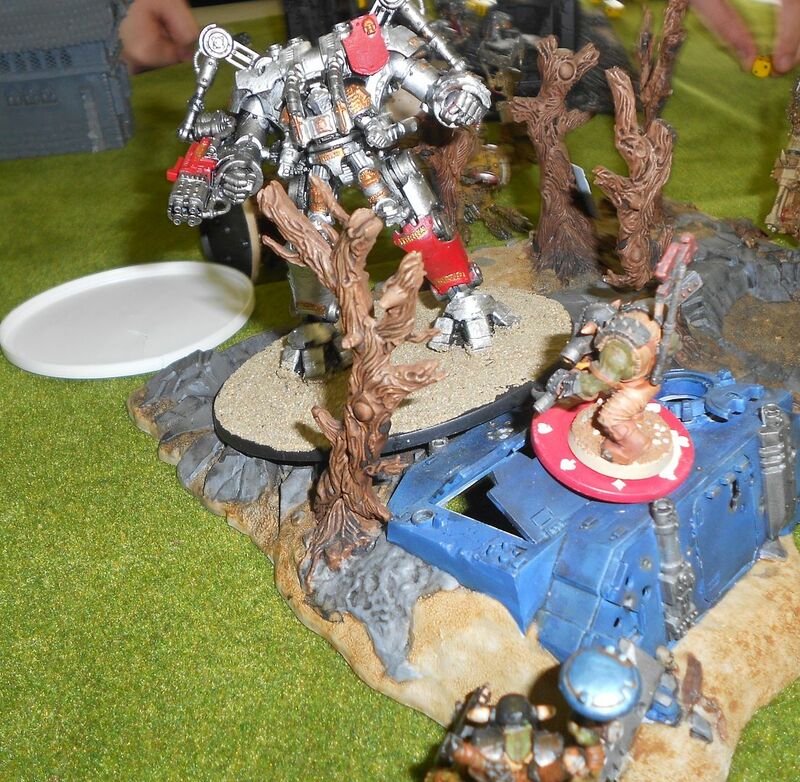 In the GK turn, the dreadknight charges me, finishing off what boys remain. Meanwhile, the lobbas have been ace, blasting grey knights left and right while the dreadknight slaughters all before it. One GK squad, on the value 4 objective flees the table and other squads get reduced. 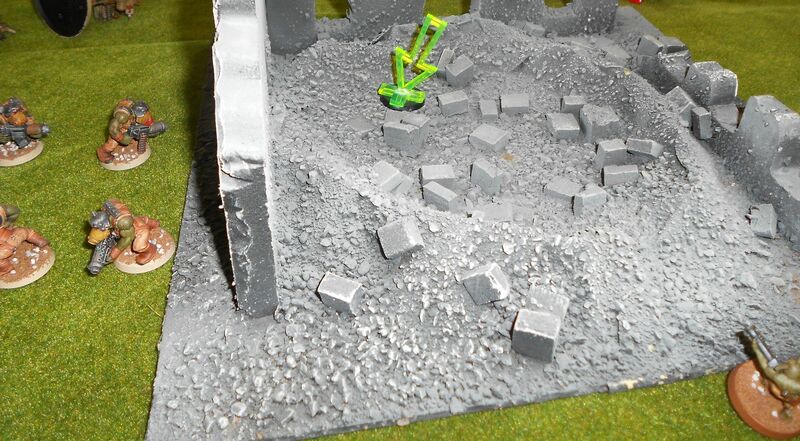 Grots come on to secure an objective. 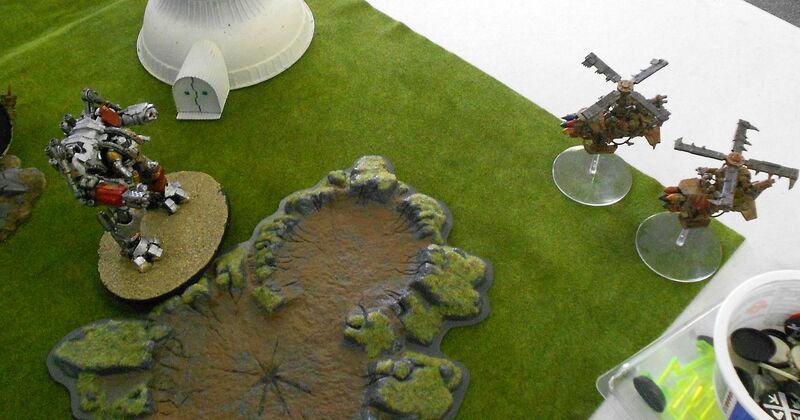 ...for a turn 5 turbo boost objective contest! The game doesn't end, and the kopta dies soon after. Despite some more lobba damage, the GK hold firm and carry the day! Victory Grey Knights! This weekend I should have my first official game of this league, vs. Patrick's Necrons. Stay tuned!